I have mentioned before that some of my fondest memories with my grandmother and Mom have been cooking together in the kitchen, for holidays and at the restaurant. 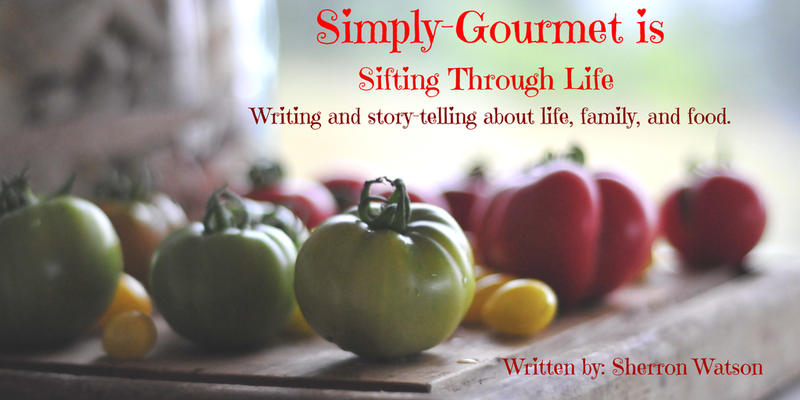 I find that as my older kids prepare to leave the nest in the next few years I am more focused on making sure they have recipes available that they can easily find (the blog), they have the basics down (rice, steamed veggies, smoothies, etc) for healthy eating in college and that they have memories to cherish. I hope that they understand and know that homemade food taste better and it's often times, better for you. 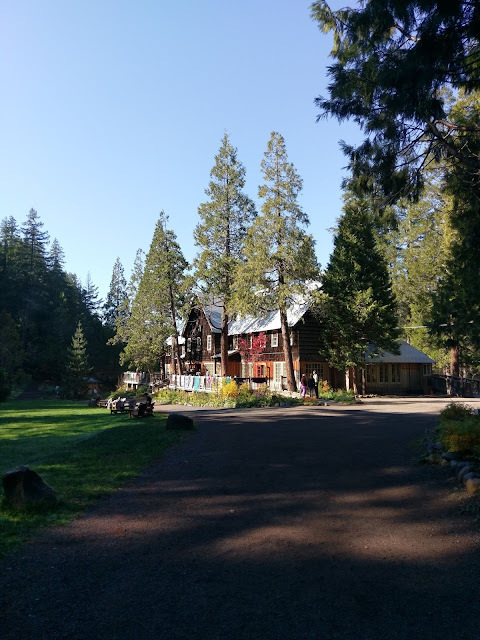 I do realize that life happens and they will have to figure out busy schedules, budgets and roommates and at times food may not be that big of a priority as it is to me. We have tried to teach them to read labels, shop as local as they can (Farmers Markets, CSA's), choose lean meat, eat plenty of fish, drink lots of water and exercise every day. 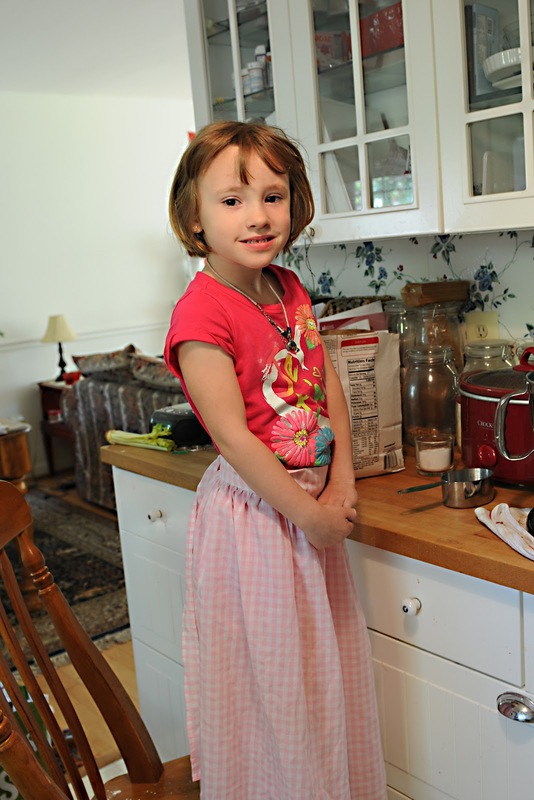 Isabella, our 5 year old, loves to cook and be in the kitchen. 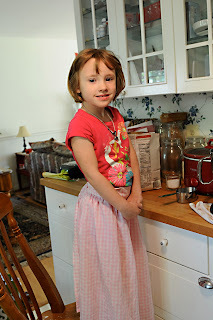 As we planned out her homeschooling weeks, I felt it was important that she have some class time in the kitchen. 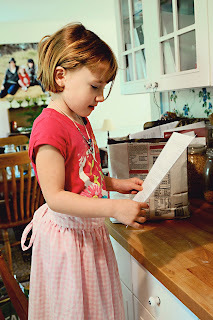 I needed a recipe that could be done in about an hour, one that she could help with her hands and that would teach her a few things (measuring, portions, time management). 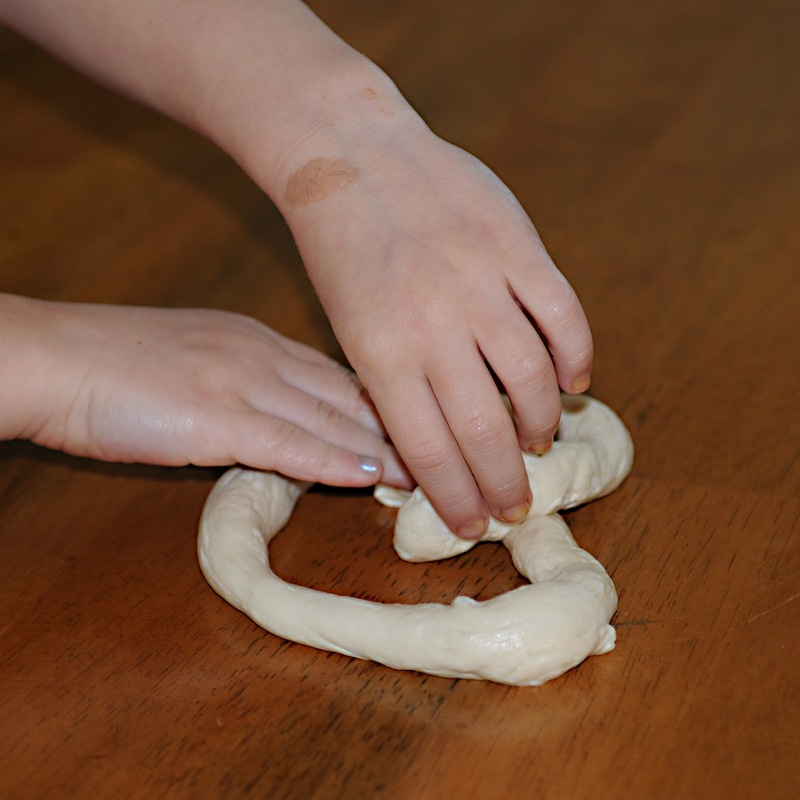 I was thrilled when Melissa from Chindeep shared on her blog that she and her daughter, Gracie had made pretzels. 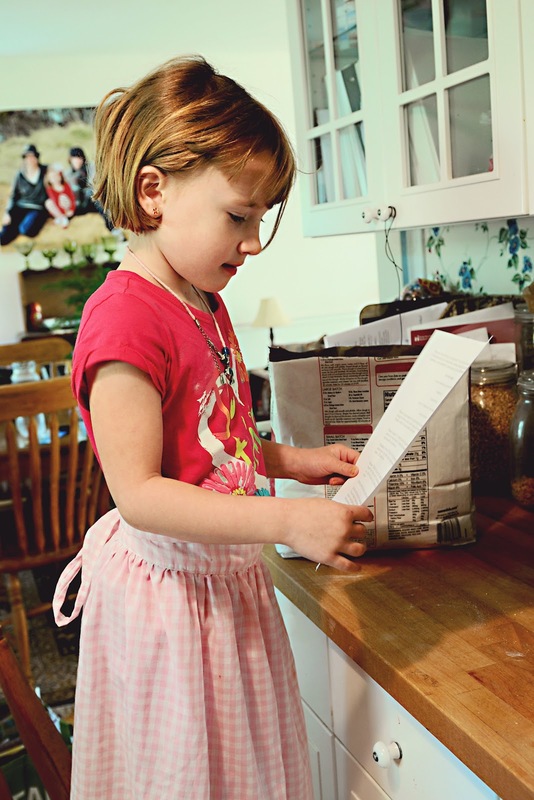 I would be able to teach Isabella how to measure flour, to read all of the instructions of a recipe FIRST ( I helped her with most of the reading) and how to use a timer. It was a great first recipe for us. 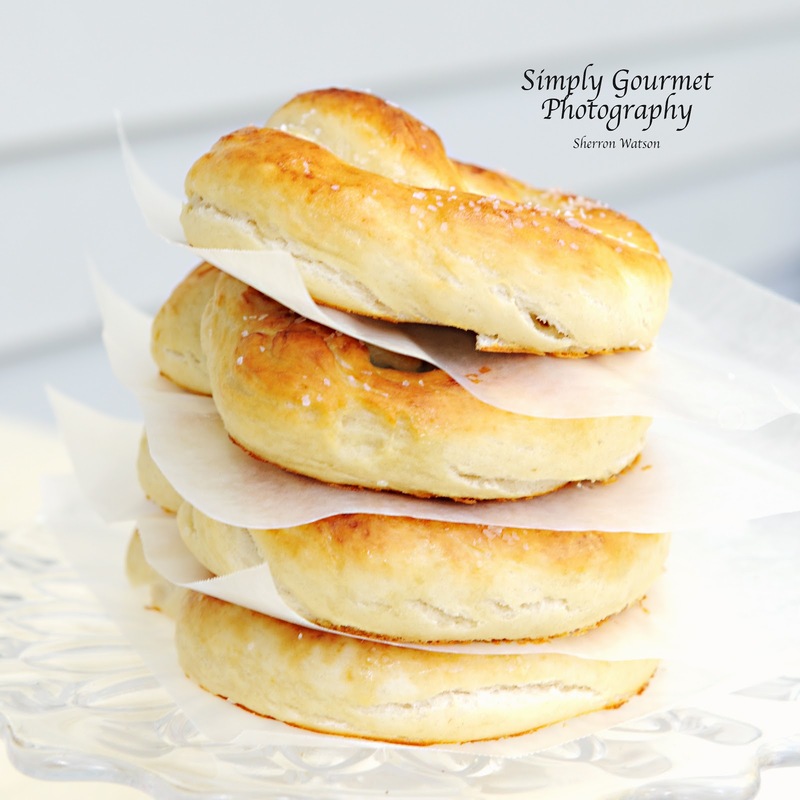 I am here to promise you that these pretzels are the best! There is that taboo word, but, they quite simply are the best that I have ever made. 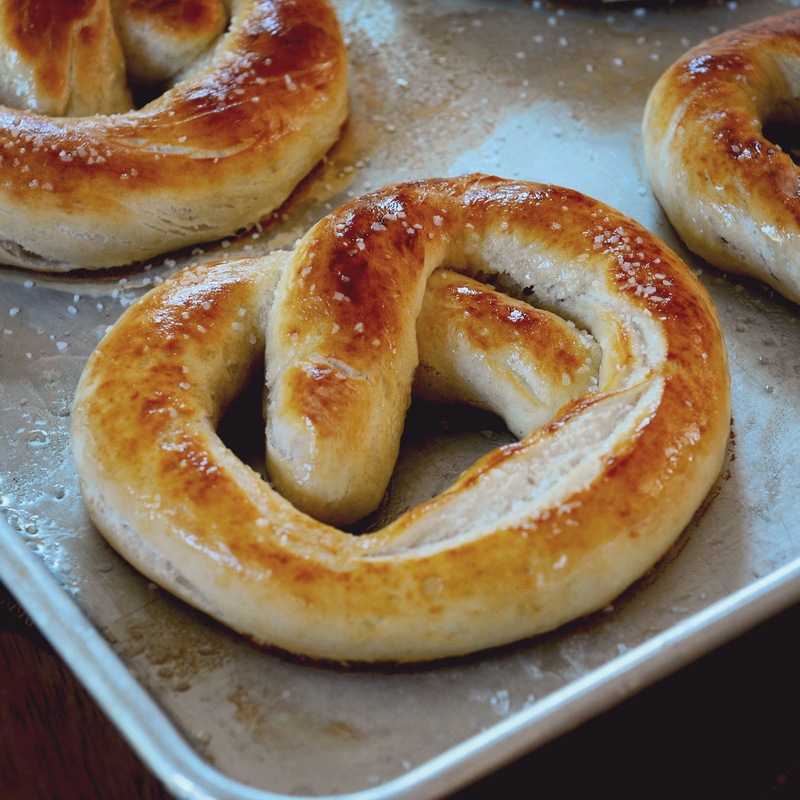 In my past attempts at making pretzels, they always lacked something….the chewy tender texture. Well, this is what I love about this recipe. 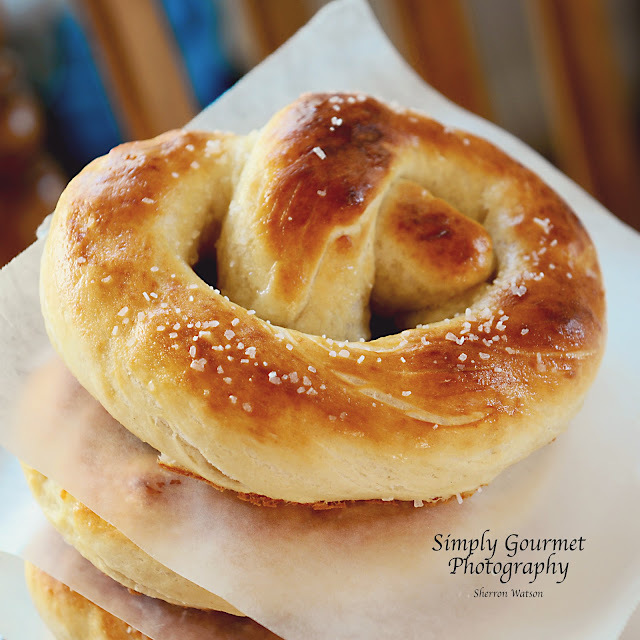 It taste just like any pretzel you buy at the mall and even better! The batch makes 12 and Isabella and I were surprised when they quickly disappeared in about 30 minutes. The family wanted more! Today, we decided to make them again. This time I was hoping to switch out some of the plain white flour for spelt (a type of whole wheat flour that some people can eat easier than regular whole wheat). It's always a bit nerve wracking when you take a perfect recipe and try to change things a bit. You just never know what you will get. My house soon smelled like fresh wheat bread was baking in the oven. This was a good sign. They baked up great. The taste was just like a wheat pretzel. Add yeast and sugar to warm water. Let rise about 4 minutes. In Kitchenaid, add flour and salt. 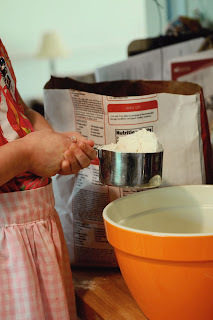 When yeast has activated, add to the flour. Mix until combined and then knead for 6 minutes. Turn your oven to 500 degrees. I had Isabella measure everything into its own bowl and then I went back and double checked as I added the ingredients to the Kitchen Aid mixer. She did really well measuring everything. Let dough rise for 30 minutes. When a few minutes are left on the rise time, prepare your warm water and baking soda mixture. For some reason my kitchen cupboards are ice cold. I microwaved my glass bowl for 45 seconds so that the dough went into a warm bowl. Have two cookie sheets ready to go. Dump your dough onto your table and cut into 12 sections. 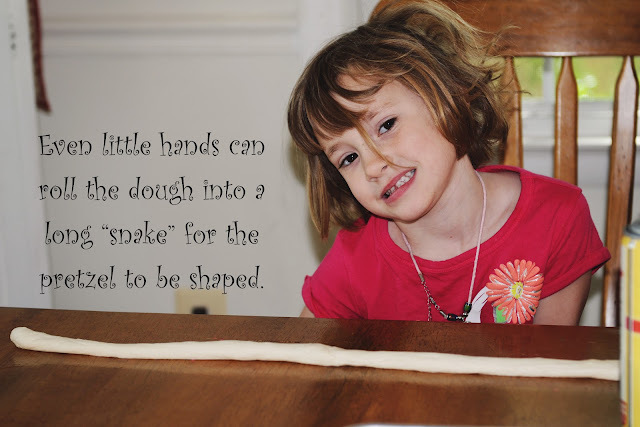 I usually cut the dough in half, then those halves are split in half again. From the four quarters on the table you should be able to get three smaller sections which will total 12 small mounds of dough. 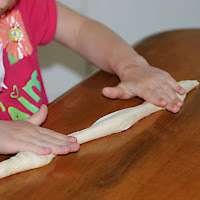 Spray your table with Pam and start rolling your dough into long "snakes, about 20 inches. Dip each pretzel in the soda wash, and place 6 on each baking sheet. Have your oven trays so that one is in the middle and one below that. Add your sheets together. Let them cook for 4 minutes and then switch the trays. If you want your pretzels to be darker then just add an extra minute or two. 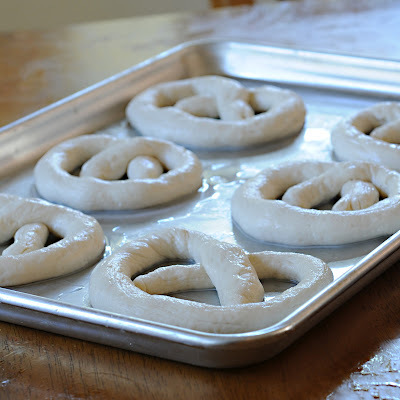 Remove from oven and transfer to a cooling rack. I brushed with butter when they got out of the oven and then sprinkled them with cinnamon and sugar or salt. Nami, let me know how they turn out for you and your kids. I make them weekly now. My family loves them. These look lovely!! Pretzels are up there with my top wants to bake but always thought it may take too long, but this recipe sounds perfect! thank you, lovely blog. Sweetcraving, thank you! After you make your first batch and realize just how easy they are you will be impressed, I know I was. Have a great evening. Sherron, these are perfect and I love your helper! My girls and I love making pretzels, so much fun and yummy!!!! Pinned. these look delicious!!! Sweet little helper too!! Found you on Its a Keeper Thursday Party! I made these with my 1 1/2 year old a few days ago. They came out awesome, thanks for sharing! 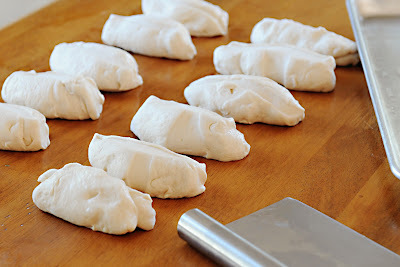 Making these now. THey look delicious! When do I add the salt? 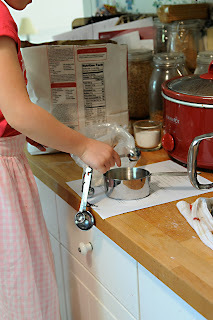 Into warm water/yeast/sugar or with flour into mixer bowl? The salt should be added to the flour. The warm water,sugar and yeast will work together to activate the yeast. Thank you for asking. I re read and proof and sometimes I still miss something. Good luck! We love this recipe in our home. Thank you for posing this question. Have a great day! I am making these again, waiting for them to rise right now! Really love this recipe!